Basic Postfix config guide for Cacti, Spam Blocking, TLS etc. This is a quick run through how I got things working which will hopefully be useful to others with similar applications. These are two relatives (both Lucene derived) but in most cases people go with Elastic Search due to scalability and generally following the heard. For me the practical thing is that my scale is (and likely never will be) large enough to warrant Elastic Search, and Solr is a lot easier to work with on small scale with php5-solr packages in Debian meaning no messing with trying to keep libraries up to date or anything like that. 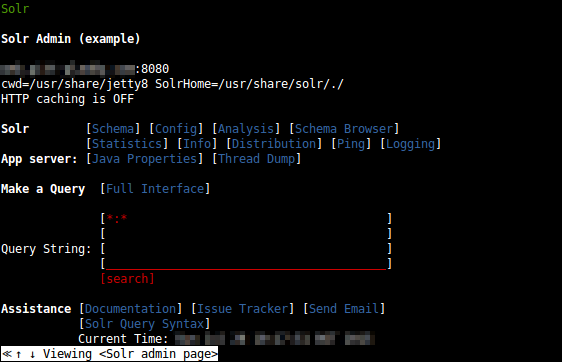 I've opted for the Jetty option (solr-jetty) as oposed to Tomcat (solr-tomcat) as it seems to be the preferred way of running Solr. I've installed the solr-jetty package, and removed all the unneccessary "Recomended" stuff like GTK/Gnome related libraries which Java wants. These are not going to be used in this case. This is easy - just install php5-solr to get the PHP class. Before we actually start coding, we need to look at the schema. Out the box Solr has an example schema which is huge and covers just about everything, but for practicality (and performance) a lighter purpose built schema is worth looking at first. In my case I really only want to be searching text with the standard parts of a web page. Meta fileds are often ignored by search engines due to containing misleading information, however as I keep mine clean (and as above, why would I want to game my own search?) I'll be including them in my index. This copies these fields into the SearchText field which is indexed but not stored (we don't want to retrieve the data back). Also note that this field is multiValued - without this you can't copy all the different values into the field. Firstly, look at /etc/solr/conf/elevate.xml and comment the example <query> blocks, leaving the <elevate> block, unless you want them, in which case update these to match your schema. If you don't then you might get errors relating to mismatches of these fields. This is the default field that will be queried, however if you don't have a field named "Text" (case sensitive) or you need a different field then you had better change this. Also note that in the example above using copyField, we would actually query the "SearchText" field which aggregates all the fields we want to search together. ... depending on how you run your PHP. In my case I run both for test & dev environments to ensure compatibility and coding discipline. At this point we should be able to start coding. It's worth putting some thought into this. I have a load of existing data to index and I've chosen to have the regular periodic maintenence routine automatically updating the index like a conventional search engine. In reality, I will be adding calls to add/remove articles from the index when I use the editor so that on publishing/updating an article it's automatically reindexed. This will make the auto-indexing code obsolete, but it serves it's purpose as a transitional tool. Updating the index for changes or new articles in the database. This is acomplished with a column in a SQL table for the Last Index Update time, for convenience as a Unix Epoch so it's easy to do numeric comparisons. Updating the index for removed / changed articles in the database. This is a bit trickier as if an article is removed the index remains (for now anyway, until I get editor based updating sorted) I'm then querying Solr for IDs based on the oldest LastUpdated field in Solr which again is a Unix Epoch. Adding data with the same field used as the "uniqueKey" replaces the index that is already there. Basically you addfield everything you want to add to a SolrInputDocument and then addDocument it into Solr. If you need authentication etc. then you need to put that in the SolrClient line. In this case we return the 10 oldest indexed articles. If they are being regularly re-indexed then any orphans will eventually end up as the oldest indexed items. You can addField more fields if you want more info returned, plus a load of other information.